As the media frantically attempts to use the mass shooting in Florida to discreetly push divide and political agendas, major revelations are being entirely ignored. Parkland, FL — One of the deadliest school shootings in American history took place this week in Parkland, Florida and the suspected gunman has since confessed to this most heinous act. As details unfold, however, the mainstream media is failing to ask the hard questions which need to be answered. While the media frantically attempts to use Nikolas Cruz to push their political agenda, bombshell revelations are being ignored, perhaps deliberately. While corporate media continues to use this incident to ram divide down society’s throat and push for gun confiscation, those of us in the alternative media world are asking questions that matter. The Free Thought Project has compiled a list of five major details about the shooting that took place Marjory Stoneman Douglas High School that the media is conveniently choosing to ignore. “I know she had been having some issues with them, especially the older one. He was being a problem. I know he did have some issues and he may have been taking medication. [He] did have some kind of emotional or difficulties,” Kumbatovich said. The reason this information is so important is that the side effects of some of these medications are known to make people violent and suicidal. 4. Cruz warned that he was going to shoot up a school and kill people and the FBI did nothing. 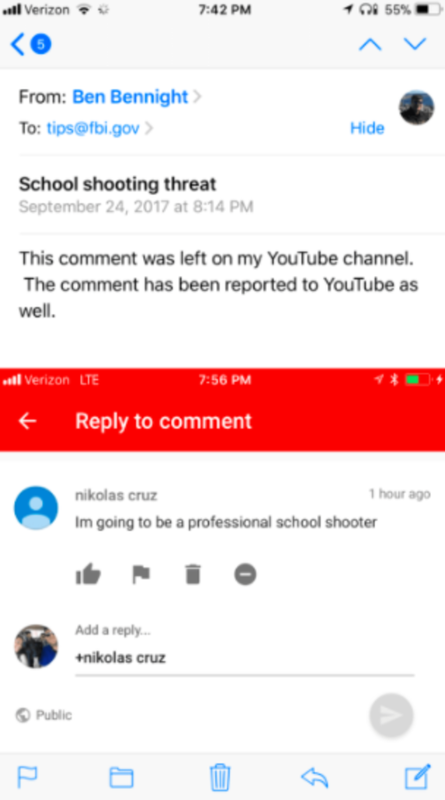 “I’m going to be a professional school shooter,” A YouTube user named Nikolas Cruz commented on a video on Sept. 24, 2017. The video was posted on the channel “Ben The Bondsman,” and the owner, Ben Bennight, immediately took a screenshot and submitted it to the FBI. Bennight told Buzzfeed News that the bureau was quick to respond, and agents from the Mississippi field office conducted an in-person interview with him the next day. As TFTP reported, there have been multiple incidents in which people have been arrested for making far less serious statements online. Now, the FBI is claiming that with all their resources—including having his full name and IP address from YouTube—that they couldn’t find Cruz after he made those comments. On top of saying he was going to shoot up a school, seven months ago, Cruz wrote, “I am going to kill law enforcement one day they go after the good people,” in the comments section of a video clip from the NatGeo show “Alaska State Troopers: Armed and Dangerous” that was posted on YouTube. In spite of threatening to kill people—a blatant violation of the law— there were no arrests, no questions, and Cruz was left alone. All of this is in spite of the fact that people have been kidnapped and thrown in cages for merely criticizing the police. The biggest story of the day on the internet yesterday was, according to the NY Times, that Jordan Jereb, a leader of a white supremacist group based in North Florida, told The Associated Press that Mr. Cruz had joined their group. But later Jereb would say that he did not know whether that was true. While the association was pushed on every outlet across the world, his retraction was conveniently ignored by the rest of the media. Why, exactly, this man would go out of his way to associate his group with a mass shooter only to retract it hours later remains a mystery. However, the effect in the media was clear: distract and divide.